The exhibition tour of the Twelve by Twelve Colourplay collection has been extended to include Sydney. Yes! all 144 art quilts from this series will be on display at the Stitches & Craft Show at Rosehill in Sydney from 7-10 March 2013. Guild member and one of the Australian Twelves, Brenda Gael Smith will be presenting a floor talk at 12 noon on Sunday, 10 March. All welcome! If you would like to learn more about the Twelve by Twelve International Art Quilt Challenge, there's a fun article about the project on the Stitches and Craft Show website. Please e-mail the Guild President if you are able to assist to promote the Guild at this event. 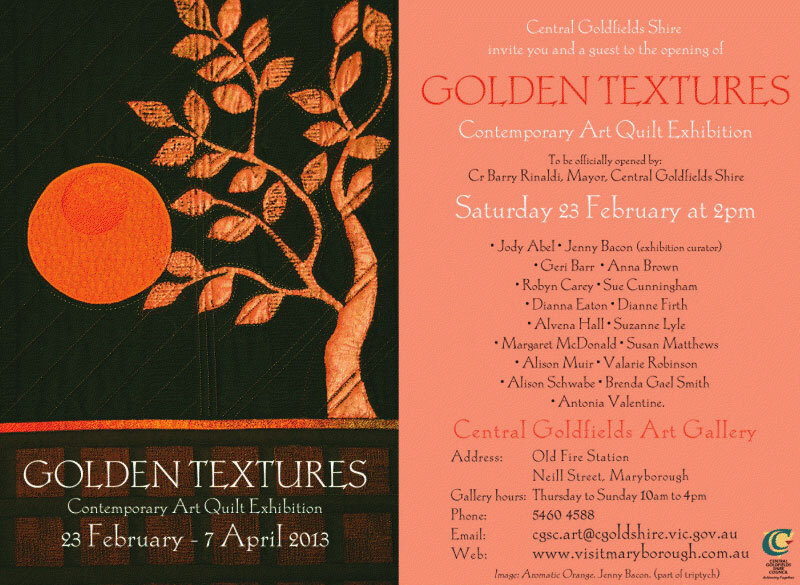 The official opening of the Golden Textures Contemporary Art Quilt Exhibition is at is at Central Goldfields Art Gallery, Maryborough, Victoria today Saturday, 23 February 2013 at 2pm. The exhibition runs from 23 February – 7 April 2013 and includes works by several Guild members including: Anna Brown, Dianne Firth, Susan Mathews, Alison Muir and Brenda Gael Smith. 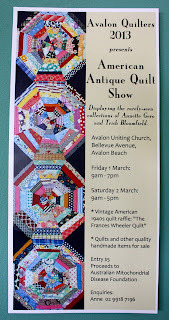 Avalon Quilters proudly invite all interested quilters and historians to a display of Antique quilts. Two well known and respected collectors of quilts, Annette Gero and Trish Bloomfield have generously allowed quilts from their private collections to be available for this exhibition. An American Vintage 1940's quilt "Frances Wheeler Quilt" will be on display, and will be the Raffle Prize. It is a top that was hand-pieced in USA and then 70 years later hand quilted by Avalon Quilters. Tickets will be $2 each or 3 for $5.00. Quilts and other quality handmade items will be for sale. 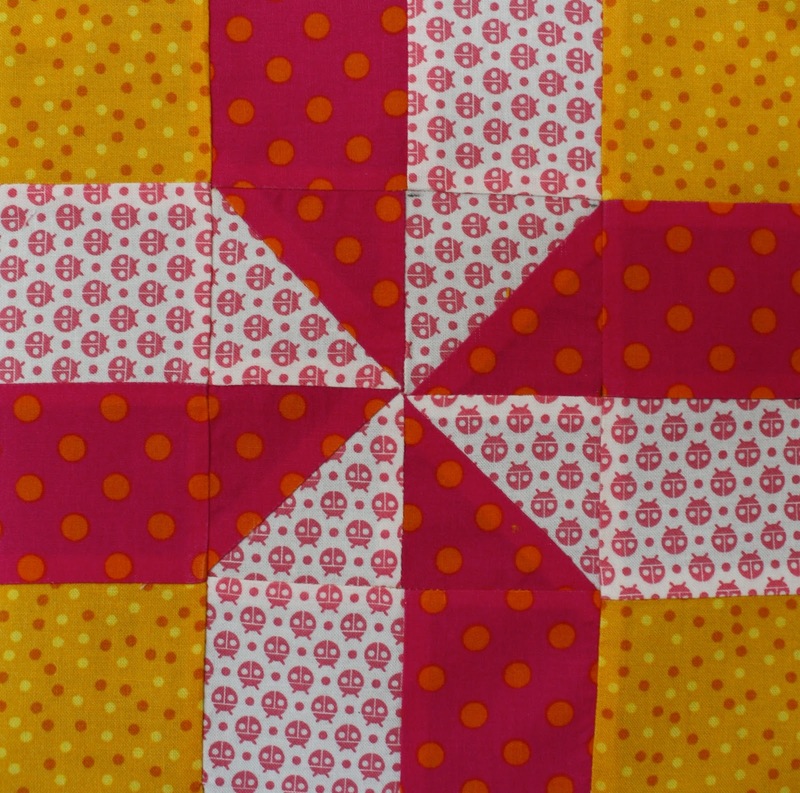 The next General Meeting of The Quilters' Guild of NSW Inc will be held this Saturday. Come and join other members to hear the quilt journey of our Guest Speaker Melinda Smith, caretaker of many antique quilts, maker of reproduction and folk art quilts, and owner of the quilt shop "Quiltsmith" in Annandale. 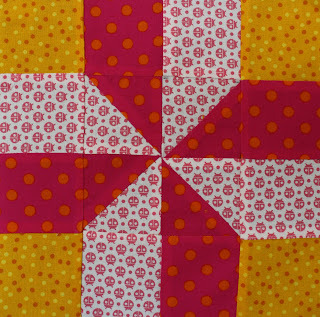 Melinda is both a generous and enthusiastic business woman, guild member and quilt history lover, thus her stories, photos and quilts are bound to be extremely interesting. Please bring any recent quilts for "Show and Tell" and your own mug for afternoon tea. The Guild is seeking a new Secretary to join the management committee. Margo-Lynne Lee has stepped down as Guild Secretary to complete her fine arts studies. She will be around to give any assistance. Please consider volunteering for this position. E-mail the Guild President for further information. 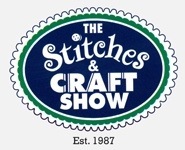 PS: If you downloaded the code for the previous quilt show buttons, you will see that it has been automatically updated to display the 2012 button - no further action required! The Guest Speaker will be Lyn Dennis. 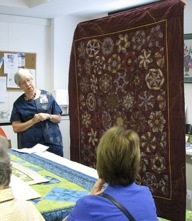 She will give an illustrated talk about her May 2012 United Kingdom Quilt Research Trip. Whilst there she was able to study some of the quilts in the collections of Norwich Guild Hall and (Lancashire) Gawthorpe Hall. Lyn will share detailed information on approximately 10 - 12 quilts from each of these collections. If you have any old English quilts or 'heritage' reproductions of such, to show, then please bring them along to share. Free Entry to Museum for all. Lynn Hewitt, our guest 'Showcaser' last week, kept guild attendees constantly in awe during her amusing and informative trip down the memory lane of her quilting journey. 'Whirling Witchety Grubs' Lynn Hewitt ( Stack n Wack ) Photo thanks to Jan Foster. With almost 500 quilts created (and many more in the cerebral pipeline), Lynn chose to bring a selection showing widely varied construction methods, differing background stories, "teaching" quilts, and several made during the workshops of other notable quilters. From painted to pieced, appliqued to embellished; Lynn has dabbled in all construction techniques, and generously divulged tips about every discovery she made along the way. She approaches her creative journey (and life) with a "can-do" philosophy, an enthusiasm that seems to rub off on all who know her. As admitted, Lynn has a current mission to improve the standard of 'Binding' in the local quilting world. With her gentle, yet persuasive manner, it shouldn't be too onerous a task! For those members who were unable to attend on Friday, several of Lynn's beautiful quilts will be on display in the Guild Office until the next Friday Showcase on April 5, when attendees will hear from prize winning quiltmaker and teacher, Catherine Butterworth. Interested Sydney and environs Quilters' Guild of NSW Inc members who wish to attend the Away Meeting in Goulburn on Saturday March 2 are advised that the meeting will commence at 1pm in St Saviours Cathedral Hall, Montague St. Goulburn. Afternoon Tea will be provided by the Goulburn group, however, attendees are advised to have lunch prior to coming to the hall. Please remember to bring any quilts for "show and tell"
Members who have previously made a commitment to attend, should have arranged transport by now for this function, however, if there are any other quilters who may wish now to join the others and are having transport issues, please be advised to contact the Guild Office for information about who will be driving to Goulburn and/ or the Train travel option. As announced in the previous 'Template Free' post, the very talented fibre and Textile Artist, Dianne Firth will be the Guest Speaker at this event. To make the 2013 Sydney Quilt Show a success, we need your help. There are many ways you can be involved. In particular, you could volunteer to help with white glove duty, selling raffle ticket and catalogues. Each time slot during the show needs 12 volunteers so you can see how vital it is to have the cooperation of as many members as possible. Volunteers are also required for set up on Tuesday 11 June and take down on Sunday 16 June. If you have entered a quilt and will be attending the Show, it is expected that you will volunteer for at least two shifts during the exhibition. Every volunteer will receive a Volunteer Quilt Show badge and a catalogue, a small thank you for the time you freely give to the Guild. Thank you for completing this form and offering your assistance. It is well appreciated. As illustrated on page 27 of The Template November 2012 this block uses pale pink, hot pink and yellow prints. It is an 8 inch block (finished) that is simple to rotary cut and chain piece. There is still time to raid your stash and find swatches of these fabrics, construct a block or two, attach your name (on paper) on the back and then bring them to the February meeting at Burwood RSL on Saturday 23 February. The Meeting Hostess is in charge of collecting blocks, with one lucky block maker winning all. If you are unable to attend the meeting, then please think of posting them to the Guild Office to arrive before Tuesday 19 February.